The Skinny: Sporadically entertaining comedy is only for those who find the teaming of Francis Ng and Nick Cheung comedic gold. Nifty role reversal is the key to this buddy comedy starring Francis Ng and Nick Cheung. The two play against type — Cheung is a hard-boiled undercover cop and Ng wears bow ties and stutters as a nerdy coroner. 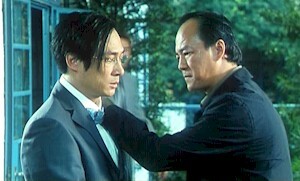 They become partners when Cheung is framed for the death of his partner and Ng becomes the only means of clearing his name. This gives us plenty of time for shtick-filled male bonding, which actually is good because the action is directed horribly. I’ve gone on record saying that James Yuen needs good producers to give us decent material, and that’s certainly the case here. Surprisingly his producer is Joe Ma, who should know better.